Parents spend countless hours and lots of money searching for the best toys for their children, especially for birthday and holiday gifts. When the time comes, finding places to donate used toys can be emotionally challenging. Lots of toys hold memories, making them hard to part with. Some remember the 15 stores they drove to in order to find "the one." The lines they waiting in for Hatchimals or a Nintendo Switch. It can be hard to forget the look on a child's face when they opened a toy, screaming excitement, saying, "This is the best day ever!" Where can you donate used toys, so that they continue to bring smiles and happiness to other children without and do not fill up the landfills? While looking for places to donate, many find that most places want new toys in their original packaging. Donating used toys can be harder than one might think. Before you can even donate a toy though, follow these tips. Are You Sure You Really Want to Donate It? 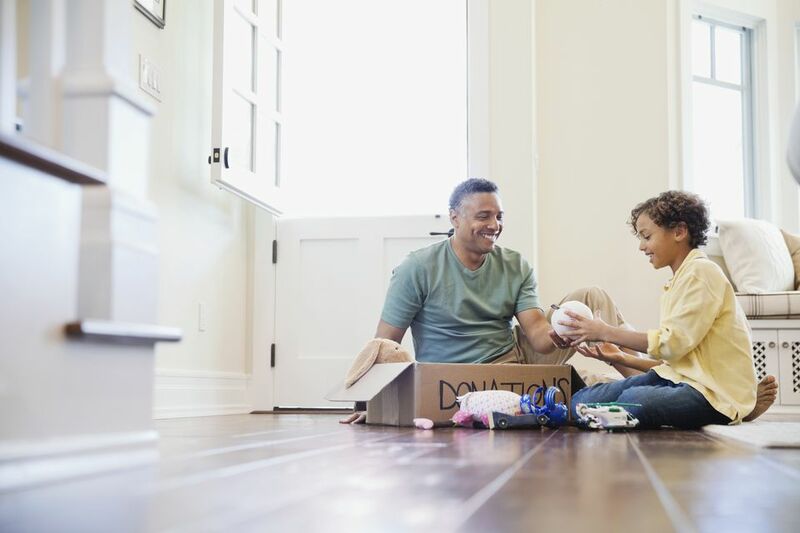 Some classic toys like dollhouses, train sets, wooden toys and ride-on toys will stand the test of time and can be saved and passed on from generation to generation, but consider this option, only if you have the space to store them. Many toys have been recalled by the CPSC, a government agency, due to choking hazards or risk of injuries. These toys are not safe. Do not donate recalled toys. Take them away from children immediately and follow the recall instructions to determine whether there is a refund, replacement kit or new product available. After toys are inspected for safety, they will need to be cleaned and sanitized. Stuffed animals can be washed in special laundry bags. Other baby toys and preschool toys can be washed with soap and water or disinfectant wipes. Battery compartments should be checked for any rechargeable batteries, old batteries and corrosion. Remove old batteries and and if possible, install new ones. Once the toy is ready to be donated, there are some organizations who might be thrilled to receive used toys. Have a niece, nephew, neighbor or family friend who might want your old toys? Send an email, text or make a phone call and ask. Do not show up to a friend's house with a trunk full of toys and transfer your junk and clutter onto someone else, especially someone you care about. If you decide to pass it on, leave the memories in a photo album or camera roll. Do not get resentful or mad if a family member says "no" or if they do not care for the toy the way you would have. Do not be surprised if a friend or family member takes the item and donate's it or even resells it to someone else. Use a Facebook status to reach out to friends and acquaintances and let them know about the unwanted toys. Within Facebook search for a local community Online Yard Sale Group and list the toy items there. Exercise caution before inviting strangers into your home. First, make phone calls and check agency websites to confirm toy donation policies before arriving at the location with toys. Agencies often change their policies and organizations may no longer be able to take used donations. Childcare centers, preschools, and churches may be in need of baby items, ride-on toys, games, play kitchens and outdoor toys for play areas. Public school systems typically enjoy gently used board games, LEGO's, and extra arts and crafts activities to keep kids entertained during indoor recess times and during after school activities or special clubs. Second Chance Toys can help provide donators with a charitable agency in their area that is taking donations. If there is not a location nearby, for those with over 50 gently used plastic toys, they will help arrange a drop-off location. Local homeless shelters may take small toys to give to children or have play areas within them to entertain children. For those who have new toys, here's more information on how to donate to the Toys for Tots program.